The March 1st Movement, also known as Sam-il (3-1) Movement (Hangul: 삼일 운동; Hanja: 三一 運動) was one of the earliest public displays of Korean resistance during the rule of Korea by Japan from 1910 to 1945. The name refers to an event that occurred on March 1, 1919, hence the movement's name, literally meaning "Three-One Movement" or "March First Movement" in Korean. It is also sometimes referred to as the Man-se Demonstrations (Hangul: 만세운동; Hanja: 萬歲運動; RR: Manse Undong). The Samil Movement arose in reaction to the repressive nature of colonial occupation under the de facto military rule of the Japanese Empire following 1905, and inspired by the "Fourteen Points" outlining the right of national "self-determination", which was proclaimed by President Woodrow Wilson at the Paris Peace Conference in January 1919. After hearing news of Wilson's speech, Korean students studying in Tokyo published a statement demanding freedom from colonial rule. Former Emperor Gojong died on January 21, 1919. There was widespread suspicion that he had been poisoned, credible since previous attempts (the "coffee plot") were well-known, and other leaders had been assassinated by Japanese agents. The March 1st Movement monument. Japanese barricade at the entrance of Pagoda Park in Seoul to prevent the peaceful demonstration. A Korean house burnt by Japanese. 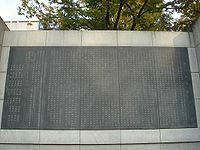 At 2 p.m. on March 1, 1919, 33 activists who formed the core of the Samil Movement convened at Taehwagwan Restaurant in Seoul; they read out loud the Korean Declaration of Independence, which had been drawn up by historian Choe Nam-seon. The activists initially planned to assemble at Tapgol Park in downtown Seoul, but chose a more private location out of fear that the gathering might turn into a riot. The leaders of the movement signed the document and sent a copy to the Governor General. We herewith proclaim the independence of Korea and the liberty of the Korean people. This we proclaim to all the nations of the world in witness of human equality. This we proclaim to our descendants so that they may enjoy in perpetuity their inherent right to nationhood. In as much as this proclamation originates from our five-thousand-year history, in as much as it springs from the loyalty of twenty million people, in as much as it affirms our yearning for the advancement of everlasting liberty, in as much as it expresses our desire to take part in the global reform rooted in human conscience, it is the solemn will of heaven, the great tide of our age, and a just act necessary for the co-existence of all humankind. Therefore, no power in this world can obstruct or suppress it! The movement leaders telephoned the central police station to inform them of their actions and were publicly arrested afterwards. These grievances were highly influenced by Wilson's declaration of the principle of self determination as outlined in his "Fourteen Points" speech. Massive crowds assembled in Pagoda Park to hear a student, Chung Jae-yong, read the declaration publicly. Afterwards, the gathering formed into a peaceable procession, which the Japanese military police attempted to suppress. Special delegates associated with the movement also read copies of the independence proclamation from appointed places throughout the country at 2 p.m. on that same day. As the processions continued to grow, the Japanese local and military police could not control the crowds. The panicked Japanese officials called in military forces to quell the crowds, including the naval forces. As the public protests continued to grow, the suppression turned to violence, resulting in Japanese massacres of Koreans and other atrocities. Approximately 2,000,000 Koreans had participated in the more than 1,500 demonstrations. Several thousand were massacred by the Japanese police force and army. The frequently cited The Bloody History of the Korean Independence Movement (Hangul: 한국독립운동지혈사; Hanja: 韓國獨立運動之血史) by Park Eun-sik reported 7,509 people killed, 15,849 wounded, and 46,303 arrested. From March 1 to April 11, Japanese officials reported 553 people killed, and more than 12,000 arrested. They said that 8 policemen and military were killed, and 158 wounded. As punishment, some of the arrested demonstrators were executed in public. In 1920, the Battle of Cheongsanri broke out in Manchuria between exiled Korean independence fighters and the Japanese Army. The March 1st Movement provided a catalyst for the Korean Independence Movement. Given the ensuing suppression and hunting down of activists by the Japanese, many Korean leaders went into exile in Manchuria, Shanghai and other parts of China, where they continued their activities. The Movement was a catalyst for the establishment of the Provisional Government of the Republic of Korea in Shanghai in April 1919. It also influenced the growth of nonviolent resistance in India and many other countries. The Korean Liberation Army was subsequently formed and allowed to operate in China by the Nationalist Government of China. During this period, there was a mobilization of Catholic and Protestant activists in Korea, with activism encouraged among the diaspora in the U.S., China and Russia. The Japanese government reacted to the March 1st Movement by heightening its suppression of dissent and dismissing the Movement as the "Chosun Manse Violent Public Disorder Incident" (조선 공공 만세 폭력 사건). Governor-General Hasegawa Yoshimichi accepted responsibility for the loss of control (although most of the repressive measures leading to the uprising had been put into place by his predecessors); he was replaced by Saito Makoto. The military police were replaced by a civilian force. Limited press freedom was permitted under what was termed the 'cultural policy'. Many of these lenient policies were reversed during the Second Sino-Japanese War and World War II. On May 24, 1949, South Korea designated March 1st as a national holiday. General Choe Hong-hui dedicated the first of the three patterns (삼일 틀 – Sam-il teul) trained by III-degree black belts of taekwon-do to the Sam-il Movement. President Woodrow Wilson issued his Fourteen Points in January 1918. The points included… in terms of US relations with Korea, "a free, open-minded, and absolutely impartial adjustment of all colonial claims." However, as manifested at the Paris Peace Conference of 1919, Wilson was not interested in challenging global power relations. Since Japan was one of the victors and Korea was its colony, a discussion of the status of Korea was not undertaken. In April 1919, the US State Department told the ambassador to Japan that "the consulate [in Seoul] should be extremely careful not to encourage any belief that the United States will assist the Korean nationalists in carrying out their plans and that it should not do anything which may cause Japanese authorities to suspect [the] American Government sympathizes with the Korean nationalist movement." From April 12 to 14, 1919 the First Korean Congress was convened in Philadelphia by Philip Jaisohn in support of the independence of Korea. Japan violently suppressed the March First Movement. The United States remained silent. Despite this, the Korean National Association planned a three-man delegation in the United States to attend the Paris Peace Conference and attempt to represent Korea's interests. Dr. Rhee (representing Hawai'i), Rev. Chan Ho Min (representing the West Coast) and Dr. Henry Han Kyung Chung (representing the Midwest) were selected, but they were unable to attend. They encountered visa problems and feared that the delegates may not be allowed to reenter the United States. A delegation of overseas Koreans, from Japan, China, and Hawai'i, did make it to Paris. Included in this delegation, was Kim Kyu-sik (김규식), a representative from the Korean Provisional Government in Shanghai. After considerable effort, he managed to arrange passage with members of the Chinese delegation to the peace conference. He traveled on a Chinese passport and under a Chinese name in order to evade the Japanese police. The Chinese were eager for the opportunity to embarrass Japan at the international forum, and several top Chinese leaders at the time, including Sun Yat-sen, told U.S. diplomats that the peace conference should take up the question of Korean independence. Beyond that, however, the Chinese, locked in a struggle themselves against the Japanese, could do little for Korea. The United States did not pay any substantial attention to these individuals, and the delegation was blocked from official participation as Korea was classified as a Japanese colony. The failure of the Korean nationalists to gain support from the Paris Peace Conference ended the possibility of foreign support. Cumings, Bruce. Korea's Place in the Sun: A Modern History. New York: W.N. Norton and Company, 1997. Han, Woo-keun. The History of Korea. Hawaii: University of Hawaii Press, 1988. This page is based on the Wikipedia article March 1st Movement; it is used under the Creative Commons Attribution-ShareAlike 3.0 Unported License (CC-BY-SA). You may redistribute it, verbatim or modified, providing that you comply with the terms of the CC-BY-SA.